I am looking for artists for the Hydrocraft mod. This includes both small 32x32 item work and larger isomeric objects. If you are interested in helping please let me know. I would search for three artist, with the large number of items. Sorry, I do not have any time. My own stuff is waiting. Looking over all the art in the mod there are 718 art I can keep since they are either from other mods or done for the mod. However there are 266 art taken from other games that I would need to get replaced. I can do some myself but its going to take awhile. Any help would be appreciated since the longer I am focused on this the less time I have to add new stuff. Just to put this straight, we have not asked you to take down the mod and are not going to stop you from distributing it elsewhere. We have asked if you have permission to use the assets of the games you took them from. Our modding rules and guidelines state "Only post content you created or have permission to use (with evidence)". Not only does this serve the purpose of keeping us safe, but also you as a modder. As a copyright owner holds the exclusive right for reproduction and derivative works, it does not matter if you are making profit by using their assets or not. The owner retains the exclusive right to decide what their material is used for. In enough cases, they are basically "forced" to protect their work in order to not provide a chance for a precedence case, which could even cause them to lose their rights. We aren't going to discuss the possibility of "fair use" here to save you a lot of attorney fees (realistically, all you'd likely receive is a cease and desist letter). It comes down to having explicit permission. Giving credit is noble but doesn't grant you the right to use the material in question. In the process, The Indie Stone will not allow such mods on their personal and private forum. We can't and won't force you to stop distributing the mod at places meant for mod distribution such as PZ-Mods or Nexusmods, but we won't allow their display on our forums. If you want to use assets you have not created, ask the creator or right owner for explicit permission. Shoot the guys at Zynga a message, asking for permission. As i said in the other post. 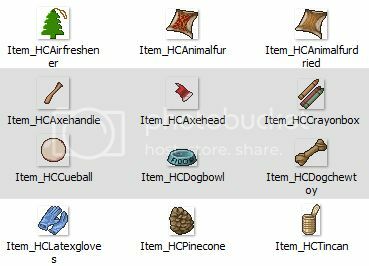 I just released v2.0b which has no Farmville, Pioneer Trail or Haven & Hearth art. I will be trying to get as much of the missing art filled in by next Friday. Any help from other artists would be appreciated. Well, I'll do the books so that's covered. Just a FYI to anyone who might want to help Hydromancerx. Thanks Svarog that will save me a bunch of work (30 out of 266). 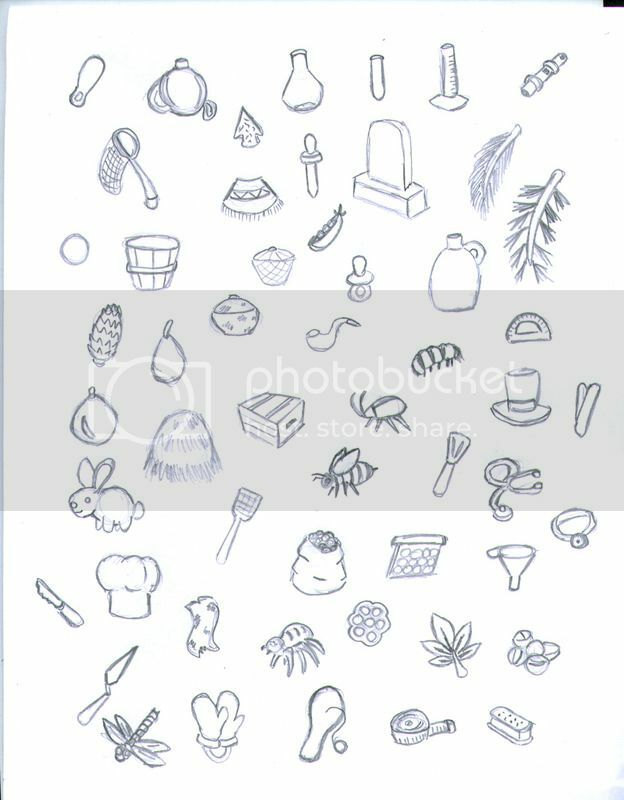 EDIT: Looking through Batura's stuff looks like I can salvage Toilet Paper, Harmonica, and Thermometer. 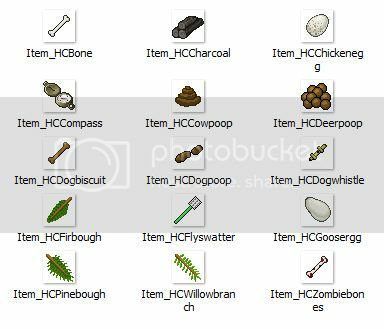 However I think there will be Toilet Paper in the build 32 update so it may not be as important to fix since it will be removed from the mod in the future. So the first batch are mostly low hanging fruit where I either use art from build 32 or altered art from the base game. However I did make the Air Freshener from scratch. Chances are the ones that use the build 32 will be removed from the mod anyways, once its out. Also I found that I left the cardboard box in. Oops! And I should not have taken the harmonica and tool box out. Those were ok.
Batch #2 are ones that we already had done but had replaced with better looking ones. 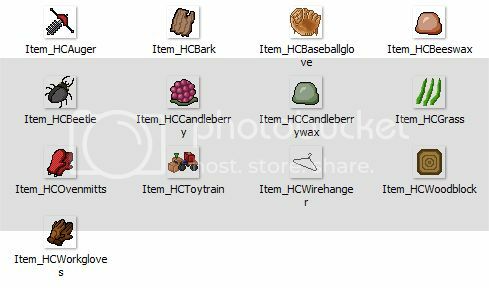 Or ones that I accidentally removed from the mod (hanger and baseball glove) when I thought they were not made by Wolfeclaw but was. Sadly i still have over 200 to do so even these little effort ones did not put much of a dent into what I still need to do. And Batch #3. Mostly new stuff but also found the binoculars should not have been removed and used the other hangers to make the wooden hanger. Plus recolored the Tommy Alice Pack to make a Large Alice Pack. Its slow going and the quality is not nearly as nice. The hard ones are going to be the big stuff like the Smelter and Dogs. I may need to hand draw those and just scan them in. As opposed to the mouse drawing I am doing now. Thanks to Svarog I have all 30 books replaced plus extra art for future books. Which means I now have around 200 left to go. Here is another batch but honestly the more I do the less motivated I am getting. When I draw its for fun, this is not fun. This is like homework in art class. On the one hand I would like to take my time and do nice art, on the other hand I have so many and want to get it done by next Friday. I am tempted just to go back to the old art and have my thread removed from this forum. At least that way I could focus on new stuff and not have to worry about the art part. This is where I wish someone could help me. cause I like art and I like modding, but both at the same time, well it become more like work then. And less like something I would want to do in my free time. Pace yourself, dude. Just nip out the art assets that conflict from your mod and update it with the new art over a few weeks (maybe by then you'll have found an artist to help take the strain off the project). you already added a TON of stuff to the game. no need to drive yourself to the point of exhaustion,V2.1 will be ready when its ready. in the meantime come to the server and just play the game. burning yourself out will only frustrate you further, take time to just play. I tried to take a different approach at this by sketching rather than trying to draw using my mouse. Note Is till need to color them all and shrink them down to the right sizes. I am not too bad at drawing animals actually but in an isomeric way not so much. So dogs and deer will be the hardest I think. On the up side sketching was a bit more fun than drawing with a mouse. 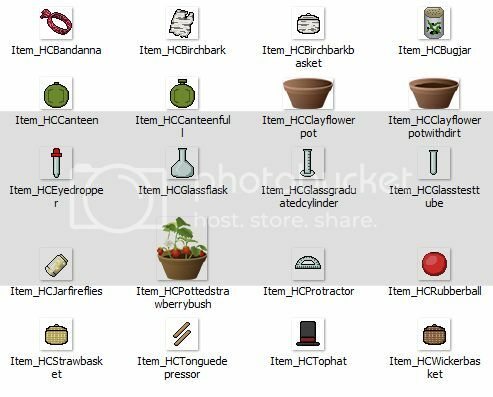 You could put a list of missing objects imaging may be able to help this mod will see a great future and I hope it stays that way. I want to add my little help. 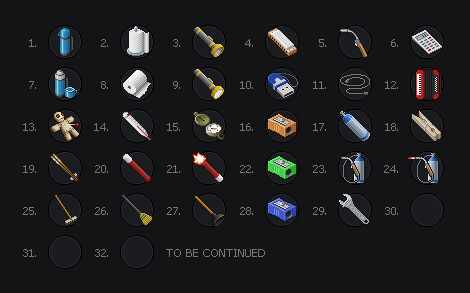 Here are the items that still need to be done. Note that I have one person working on the small bugs and another person working on the potted plants. How many they do I will have to see. The rest are more or less up for grabs. Any help would be great. Oh also if you think you can make any of the ones I did above (not the sketch) better be my guest. Here is another batch. Slowly reducing the list. Note the Bandana is from Batura, the Jar of Fireflies are from WolfeClaw and the Pots and Potted Strawberries are from my friend Rhodix who is working on the rest of the potted plants. Those flowerpots look oddly out of place. You're kind of keeping with a single style for all the rest, then WHAM a completely different style for the flower pots. I was wondering for a while now if there's anything I can help with. I'm used to drawing, although the low-res thing kind of passed me by. I'll have to experiment a little to get it right, but I have to know exactly what is required of me. In any case I'm willing to help because this mod seems to be what I wanted for a long while. Being absolutely self-sufficient in games like PZ is what matters most to me, personally. So please, point me in the right direction and I'll try to help. Also, sorry, I've spent too many years on imageboards and whatnot so this forum system feels alien to me. Any help is very much appreciated! Here is what is left. See the other page for how they looked. Many thanks in advance! A'ight mang, I hope it's not against the rules (I didn't exactly read those) to ask things exactly in this thread. Uh, I'm an amateur and have never tried pixelart\isometric stuff so don't expect much. Anyway, look, true pixelart seems insanely difficult so I decided to just draw things, then downsize them. But it seems that it's better to not think about details too much, because they are non distinguishable after re-sizing. So here the question is: should the high-res versions be less detailed to save time and effort? 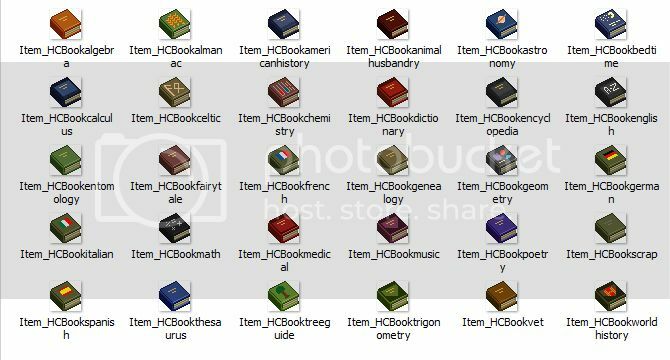 Then there's this thing, I noticed that the notebook's icons are separate, as in there's one for inventory look, and one for on-the-ground look. 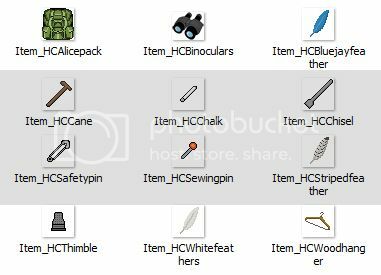 I suppose there's a way to make different icons for the same item, so the bigger-than-32x32 would fit into the inventory screen. Aight. Um, I basically just started, tell me if the looks are satisfying and I'll keep up in the same manner. I'm unemployed and not really doing anything in real life, albeit I'm extremely lazy, so the pace of doing things should be considerably mediocre. EDIT: Forgot to ask if I should draw shadows beneath objects like anvil. I probably should. Wow! That looks great! Yeah there is a tag on the Propane Tank that I use to allow for art bigger than 32x32. The side effect is that it bleeds over in the inventory. Not much that can be done about that. You can add a shadow if you want. Anywho you helping with the large objects then? And yeah, large objects seem like fun. That measuring tape I did turned out to be something I probably wouldn't distinguish myself if not for the name of the object. I'll still try to do my best with the small objects, too. If there's anyone who's done the objects I did/will do - throw mine out, I'm cool with that. For now I suppose I should get the large objects done, so I'll post them when they're finished.